The Boxer 320 mini skid offers a number of badass features — but the most interesting is that for about $80, you can rent it for the afternoon at the local home center and fit it through the garden gate. At around 34 inches wide, the Boxer can get into the the backyard or even pack itself into the back of a pickup and arrive on scene ready to work. Equipped with a compact 20 hp Kohler motor, the Boxer can lift up to 625 lbs. over 54″ in the air, depending on the tip weight at the moment of lift and what attachment is stuck out front. At any rate, it’ll tear up a great deal faster than any mere human could do. Plus, riding on the back and operating a few controls beats lifting or breaking dirt yourself. 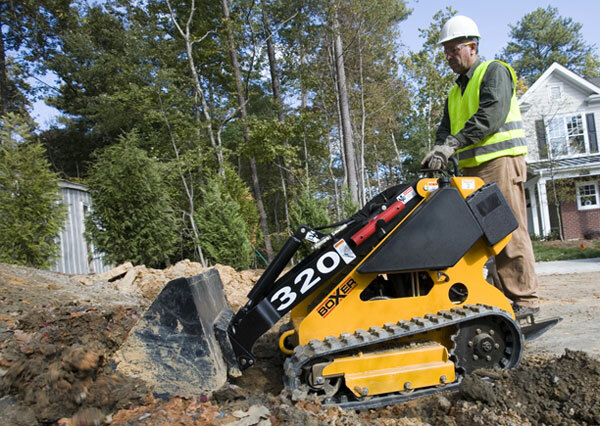 The other great thing about the Boxer 320 is you don’t need tons of training like a backhoe or even a Bobcat to get projects done — a few minutes trying it out and you can get moving in no time. Depending on the job, augers, buckets, or any other manner of heavy hydraulic tool can be mounted to the front for work. Powerful and simple to use is one thing — but given that you most likely won’t even tear up the yard at 3.2 psi of ground pressure or have to dissemble the fence to get the 320 where it needs to do its job, the hidden power of the system is that anyone can do the heavy work quickly without spending a great deal in the process. Rental price seems high, I can rent an LS160 for that price. Its more about having the right tool for the job, ls160 heavy, wide, overkill(maybe) this tool is a nice option for the person with smaller projects maybe requiring a less impact solution. Not all projects need a sledge hammer might just need a small mallet. Pretty sweet how this isn’t wrecking the grass, at least not to much. I wasn’t saying it doesnt have a place. I just think if I can rent a sledge hammer for $80, I should be able to rent a rock hammer for $50. A very cool tool for a sort of lmited market, yes it fits through a fence but a couple guys with shovels can probably move dirst around just as fast as hauling this thing somewhere and having it crawl across a yard and slowly do the work, because it is slow. I think there is a post hole digger for this that looks promising, the hand held type manual or motor driven type is really though on people. The rental price is not to bad, being from the UK I am not sure if we have these yet. Like the Toro Dingo, renting one of these with the auger attachment is so much easier (and possibly more cost-effective) than a two-person auger for doing deck piling holes. Kobelco used to make an excavator this size. Surprisingly, it got a lot of rental business because it could fit in the back of a van, drive under a deck and do the work of a couple off guys with shovels for less money and less hassle. This thing definitely has a market, you just may not be that market. If you want something even more specialized check out http://singletracktools.com/ fro machines designed to build mountain bike trails. I own a Toro Dingo, and I’ll tell you these things are much more versatile then you think. With my 4-1 bucket I can just about do anything with it. Literally its equal to 4 guys with shovels and wheel barrows at a high pace of work. Slow Joe Crow: Those single track machines are wild!!! I want one. I have kind of problematic neighbours who are really tired of me working on my home. Thinking about creating a small pond in the backyard. This might be just the solution i was looking for as to not worry the neighbours! 80$ isn’t too bad for the convinience. Also looks plain fun!